"Concealed handgun" means a loaded handgun that is not visible to the ordinary observations of a reasonable person. 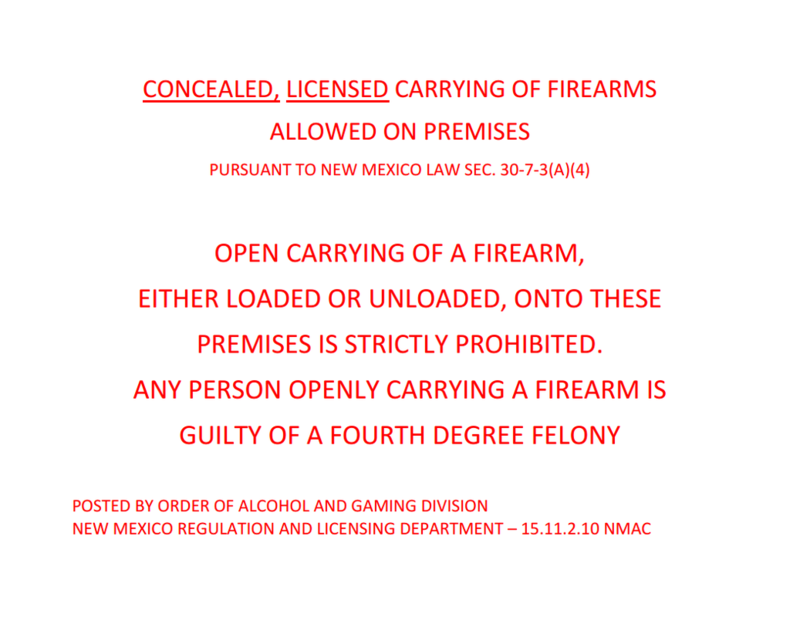 "Carrying a deadly weapon" means being armed with a deadly weapon by having it on the person, or in close proximity thereto, so that the weapon is readily accessible for use (30-7-1). Concealed handgun licenses are issued by the Dept. of Public Safety (page includes FAQ, application info, and other resources). Licenses shall be issued or denied not more than 30 days after receiving the application and completion of the background check; this is deceiving as background checks can take up to 90 days. You may renew a licensed anytime from 60 days before the license expires to 60 calendar days after the license expires. You may not carry on an expired license. The initial course is 15 hours. Licenses are valid for four years with a two-hour refresher course every two years. License renewal courses are 4 hours in length. The Dept. of Public safety reports it takes about 12 weeks to receive a license. New Mexico does not issue non-resident licenses. You must have your license in your possession at all time when carrying a firearm. 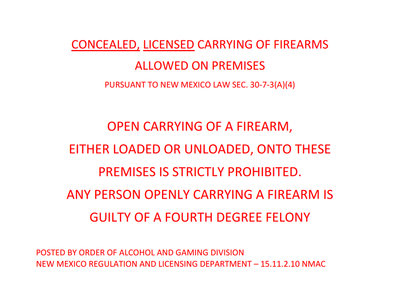 No person shall carry a concealed handgun of a different category or higher caliber than is indicated on the license issued to that person by the department, 10.8.2.16A NMAC. Qualified on a 9mm? Can't carry a .45. Qualified on a .500 S&W? You can carry just about every caliber of handgun. 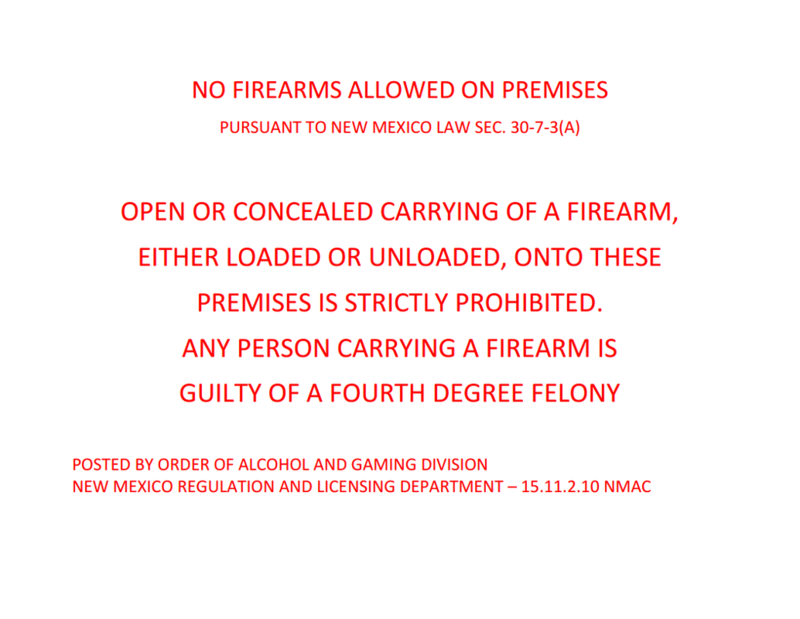 A licensee shall only carry one concealed handgun at any given time, 10.8.2.16A NMAC. Not be addicted to alcohol or controlled substances. Military service members or dependents, see 29-19-15. Have been convicted of a misdemeanor involving assault, battery or battery against a household member (domestic violence). Proof of citizenship: A certified copy of a birth certificate or proof of United States citizenship, if the applicant was not born in the United States. Other proof acceptable to the department. Proof of age: a copy of a valid government-issued identification card or a certified birth certificate. Possession by an applicant of a driver's license issued by another state shall create a rebuttable presumption of residency in such other state. Authorization for Release of Information. ​The non-refundable application fee is $100 ($44 for the background check + $56 for the application fee). Current and retired law enforcement officers are exempt from this fee, 10.8.2.12. Fingerprints are handled by a vendor, 3M Cogent. Locations are searchable here. Learn more about the New Mexico Applicant Processing Service (NMAPS). You must have satisfactorily completed a firearms training course approved by the department for the category and the largest caliber of handgun that the applicant wants to be licensed to carry as a concealed handgun, 29-19-4(10). An applicant shall prove that he or she can competently and safely fire a handgun by filing a certified copy of a certificate of completion for a firearms training course approved by the department issued by an approved instructor not more than 90 calendar days prior to the date the application is filed. Law enforcement officers and concealed carry instructors are generally exempt. Techniques for nonviolent dispute resolution. A licensee shall complete a two hour refresher course two years after the issuance of an initial or renewed license which shall be range qualification of their approved caliber of handgun and the instructor shall notify the department within thirty (30) days on a form prescribed by the department. A licensee seeking renewal of a license shall satisfactorily complete a refresher firearms training course approved by the department that includes at least 4 hours of classroom and firing range instruction.. The department may suspend a license if the licensee does not comply with the refresher requirements. Upon complying, the licensee shall submit a $5.00 reinstatement fee. An applicant or licensee shall demonstrate competency in the safe use of each category and highest caliber of handgun for which he or she seeks certification by firing the handgun with live ammunition at a target no larger than 12 inches wide and 18 inches high. An applicant or licensee shall fire 15 rounds from three yards and 10 rounds from seven yards. An applicant or licensee shall score 4 points for each shot that hits within the scoring line and zero points for each shot that hits outside the scoring line. An applicant must obtain a score of 72% to pass the competency demonstration. Must demonstrate knowledge and understanding of the subjects specified in Subsection A of NMSA 1978 Section 29-19-7. 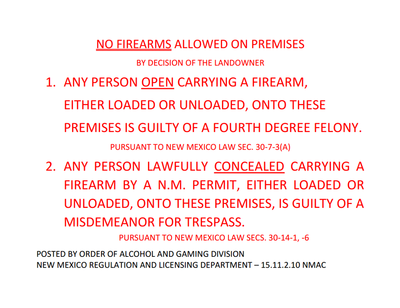 Current certified law enforcement officers employed by a law enforcement agency and residing in New Mexico are not required to attend a civilian firearms training course. 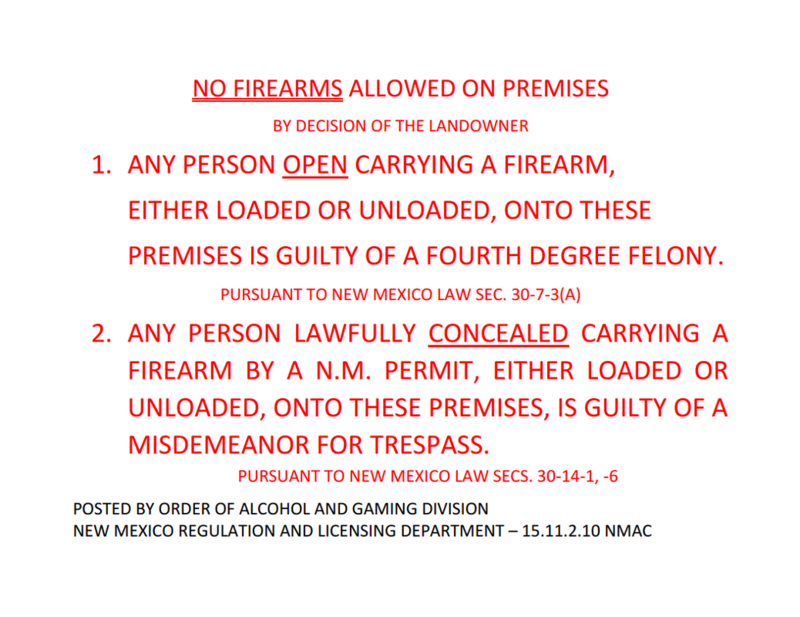 Law enforcement officers who are residents of New Mexico and have retired in good standing within the previous 10 years are not required to attend a firearms training course. Law enforcement officers retired longer than 10 years are required to attend a firearms course pursuant to the act. If the department finds, after notice and a public hearing, that the person teaching the course was not an approved instructor, was impaired, or was teaching something contrary to law or accepted safety practices, the department may order the person to refund to every student in the class the person was teaching any fees paid by the student to take the class. If the department finds that all or any portion of the firearms training course was deficient because the instructor was not an approved instructor, was impaired, or was teaching something contrary to law or safety, the department may require the students in that class to retake the portions that were deficient. The department may also initiate proceedings to suspend or revoke the approved instructor’s license. The department, within 30 days after receiving a completed application for a concealed handgun license and the results of a national criminal background check on the applicant. This is deceiving as background checks can take up to 90 days. ​If the department finds that the applicant does not meet the requirements for issuance of a license, the department shall cite the particular requirements of the act or this rule that the applicant has failed to meet, 10.8.2.13B(2). Is subject to a valid protective order issued by a court. The department shall review the affidavit and attachments, and, if the department finds probable cause to suspend or revoke the license, may issue an order of suspension or revocation to the licensee advising the licensee of his right to a hearing in accordance with 10.8.2.26 NMAC. If the licensee elects not to request a hearing, the licensee shall surrender his license to the department within 15 calendar days of the expiration of the period for requesting a hearing. The department may suspend a license for up to one year. The licensee may file an application to renew the license upon expiration of the term of suspension. The department may revoke a license. The person whose license was revoked may file an application for another license no earlier than one year from the date the license was revoked. The department shall mail an order of denial, suspension, or revocation and instructions for requesting a hearing to the respondent. The order shall become final on the 35th day after the date the notice was postmarked unless the department receives a request for a hearing, or the notice is returned to the department as undeliverable, before that date. Provide any additional documentation to support the challenge. Within 30 days of receipt of a request for hearing, the department will mail a notice of hearing to the respondent. The hearing shall be held within a reasonable period of time, but in no case sooner than 20 days after the notice is postmarked or later than 90 days from the date the department receives the request for hearing. The department may extend the time for a hearing one time for up to an additional 60 days. The department shall not unreasonably deny a request for postponement of the hearing made by a respondent. The hearing shall be conducted in an informal manner. The hearing may be conducted in person or by telephone conference call, video conferencing, or other appropriate technology at the department’s expense. Testimony at the hearing shall be taken under oath. Call, examine and cross-examine witnesses. At the close of the hearing, the hearing examiner shall review and consider the entire record, prepare findings of fact, conclusions of law, and a recommended decision, and submit them to the secretary not later than 20 calendar days after the close of the hearing. The hearing examiner shall make a finding on each ground for denial, suspension, or revocation alleged. The recommended decision shall be based upon substantial, competent, and relevant evidence and testimony appearing in the record of hearing. Within 20 calendar days of receipt of the recommended decision, the secretary shall review the record of the hearing and issue a final order affirming the denial of an application for, or suspension or revocation of, a license or permit or reversing the denial, suspension, or revocation and authorizing issuance or reinstatement of a license or permit. The department shall mail a copy of the final order to the respondent. The final order shall be based upon substantial, competent, and relevant evidence and testimony appearing in the record of hearing. A respondent adversely affected by a final order of the department may file a petition for a writ of certiorari in the district court in the county where the respondent resides within 30 days of the date the final order was postmarked. The appellant shall bear the costs of the appeal. If applicable, proof of reemployment with a law enforcement agency. The department will issue a replacement license within 10 days of receipt of the application. A nonrefundable $5.00 processing fee. A licensee may file an application for a renewed license on the form prescribed by the department. The licensee may file the application anytime from 60 calendar days before the license expires until 60 calendar days after the license expires. If the license has expired, a licensee shall not carry a concealed handgun until he receives his renewed license. The licensee shall complete a refresher firearms training course prior to filing the application. A copy of New Mexico drivers license or other government issued identification which contains a picture. 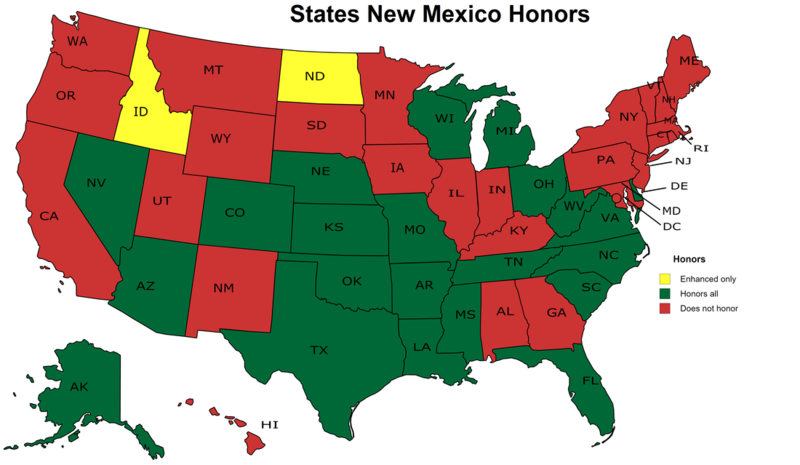 New Mexico does not offer a true reciprocal transfer of licenses from other states. One must essentially apply for a New Mexico license from scratch. A photocopy of the license being transferred. An initial firearms training course if the firearms training required by the other state does not meet New Mexico firearms training requirements or the licensee completed firearms training more than 1 year prior to filing the application. The applicant has satisfactorily completed the requirements for issuance of a license in New Mexico that were not applicable in the other state. The department has 30 days to issue or deny an application for renewal or transfer. A licensee shall have his concealed handgun license in his possession at all times while carrying a concealed handgun, 29-19-9. 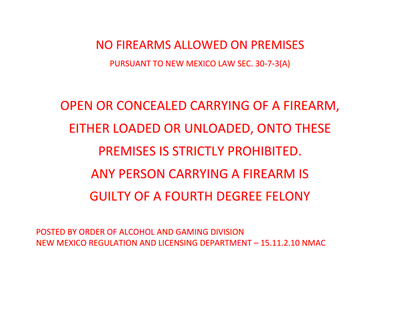 A restaurant licensed to sell only beer and wine that derives no less than 60% of its annual gross receipts from the sale of food for consumption on the premises unless the restaurant has a sign posted, in a conspicuous location at each public entrance, prohibiting the carrying of firearms, or the person is verbally instructed by the owner or manager that the carrying of a firearm is not permitted in the restaurant (Figure ). You cannot carry in a restaurant with a full bar. Requires that an applicant satisfactorily complete a firearms safety program that covers deadly force issues, weapons care and maintenance, safe handling and storage of firearms and marksmanship. 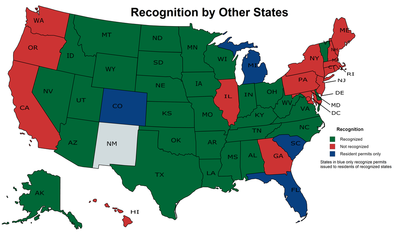 Each state which the department has afforded transfer, recognition or reciprocity shall be listed on the department’s web page.